When it comes to gifts and surprises then I am such a girl as I love presents in any shape or form and well who doesn’t love a great surprise? When it comes to cupcakes I have not held back in my enthusiasm and passion for them and my family, friends and the people I meet through these cupcake creations have all had their ears bent at many times as I not only love to bake cupcakes but also love to talk about them. 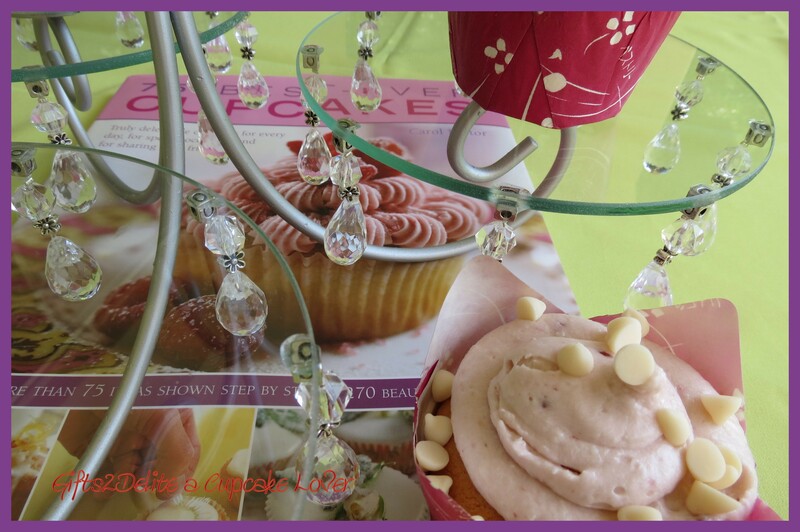 The gift of this beautiful stand was a surprise as it was made for me in order to display my cupcakes and made with these dazzling beads which yes you guessed it … I love. Thank you Russell for capturing everything I love in this gift. 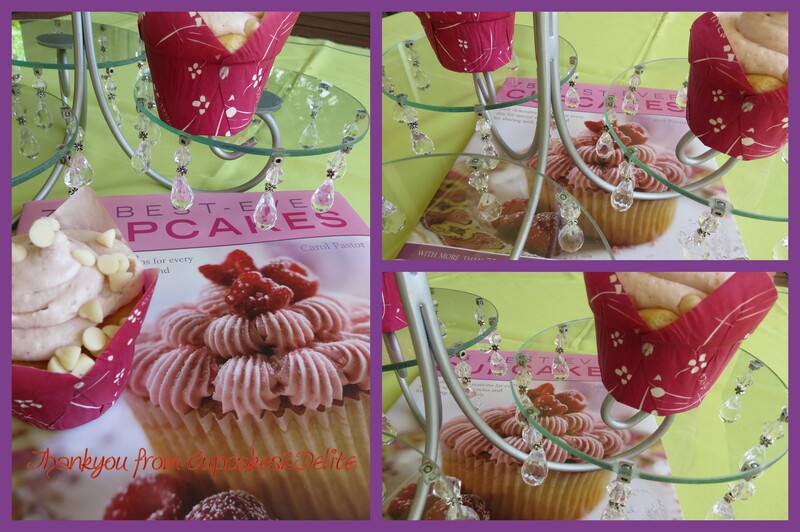 It is so perfect with its 3 little glass display plates and pretty beads and fits 12-15 large cupcakes. It makes an elegant display stand on any table and I am loving using it already. On the same afternoon I came home with my beautiful stand my friend Sonja surprised me with a pack of these rich raspberry-coloured cupcake holders. This made it a double excuse to bake some cupcakes immediately. Luckily during my trip to Edenvale and the Chocolate Den another few of their essences, this time raspberry, passionfruit and apple, made it into my basket. What could be more perfect than Raspberry and White Chocolate cupcakes to fill these cupcake holders and to grace my cupcake stand? Out came another gift I use often for the delicious recipes and icing ideas, Carol Pastor’s 75 Best-Ever Cupcakes. Wendy gave this to me for my last birthday and the recipe for the Raspberry Buttercream is easy and really delicious. Carol adds 25ml raspberry jam to her icing which gives it a sweet fruity taste and gorgeous colour. I added the raspberry essence to the cupcakes but not to the icing as the jam gives it plenty of flavour. Sprinkled with white chocolate chips these cupcakes were a designer ending to my day of surprises. ← Whitney Houston Cupcake Tribute! It is great to be inspired too by such an awesome group of scrappers!